A new series five US Classic stamps was issued beginning in July 1851. These new US postage stamps were necessitated by the implementation of new, lower postage rates, effected on that date. The five new denominations will be described individually below. These new US stamps were all engraved on white paper, and their printing was contracted out to Toppan, Carpenter, Casilear & Co. of Philadelphia. The new stamps were all printed from plates of 200 subjects, divided into panes of 100 for sale at US Post Offices, and they were all issued imperforate. This series, has been the most popular specialty area with US philatelists since the beginnings of stamp collecting in this country. The fascination with them continues today, although what was a reasonable philatelic specialty a hundred years ago has become an extremely expensive one in modern times. One of the most beautifully designed of all US classic stamps is the one cent denomination issued on July 1, 1851. The stamp features a portrait of Benjamin Franklin, and it was issued for the prepayment of postage on newspapers and drop letters. There are eight major "types", which the Scott Catalog lists as Type I (#5), Type 1b (#5A), Type Ia (#6), Type Ic (#6b), Type II (#7), Type III (#8), Type IIIa (#8A), and Type IV (#9). 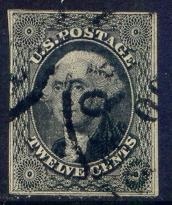 For drawings and descriptions of all the individual types of the 1 Cent issue of 1851, please refer to the Scott US Specialized Catalog or to the Scott Standard Postage Stamp Catalog Volume I. Types II (#7), IIIa (#8A), and IV (#9) are shown in the image above. These are the only "affordable" types of this issue that most collectors could ever hope to acquire, unless they have a stamp collecting budget of tens of thousands of dollars! One might get the idea, from the Scott Catalog classification of these US classic stamps, that they are separate "issues". They ARE NOT! The 1 Cent stamps all come from four plates made from the same original die. The plates are called Plate 1 (Early and Late states), Plate 2, Plate 3, and Plate 4. The different "types" on these one cent denomination US classic stamps were caused by a combination of four possible scenarios. These are: relief trimming on the transfer roll, short transfers or double transfers onto the plate, re-cutting of the positions on the plate, and erasure or burnishing and then re-entry of positions on the plate. As the plates were laid down by hand and the positions were frequently re-cut to improve alignment and appearance, this caused the many variations that we call "types" throughout the 1,000 positions on the plates used for these imperforate stamps. In fact, there are no two positions on the four plates that are exactly alike. That's what makes plate reconstruction possible by specialists in this issue. Why aren't all the impressions on the plates Type I? When the plates were first made, it was discovered that the original die impression was too large to fit on the plates 200 times. As a result, almost all the 200 impressions had to be altered, in order to make them fit onto the physical plates. Of the 1,000 positions on the plates used to print the 1 Cent stamps, only one of them had the original, unaltered die impression. This stamp is position 7 from the right pane of Plate 1 in the early state, what we call position 7R1E. Today, it is one of the greatest rarities of all the US classic stamps. It is shown in the inset image at the left (Sc. #5). This one sold in a 1999 auction for $60,000. There are two mint examples and an estimated 100 used examples believed to exist today. With the cost of buying the 1 Cent stamps in quantities these days being so expensive, it would be hard to imagine someone beginning a plate reconstruction or plate variety study of this issue. But, if you want to, there is a book you MUST HAVE! The "bible" of the 1 Cent 1851 issue specialist is: The United States One Cent Stamp of 1851 to 1861, by Mortimer Neinken. It is a revision of the original: United States One Cent Stamp of 1851-1857, by Stanley Ashbrook. These two philatelists are among the most celebrated icons of US classic stamps. Unfortunately, the Ashbrook book is un-obtainable, and the Neinken book was last printed about 40 years ago! If you're lucky though, you can possibly pick up a used copy from a philatelic book dealer -- the going price is about $600 for one today. If you're an American Philatelic Society member, their research library has copies you can borrow, as well. The very intricately designed three cent denomination stamp was issued on July 1, 1851, and it featured a portrait of George Washington, based on the Houdin statue in the State Capitol in Alexandria, Virginia. This stamp is the most widely collected and studied of all the US classic stamps of the 1851-1856 general issues. The three cent stamp was issued for the payment of postage on one ounce letters traveling less than 3,000 miles. 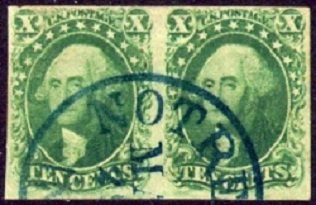 As there was no six cent stamp, pairs of these were used to pay postage on letters traveling in excess of 3,000 miles (until 1855), thus, pairs of this imperforate stamp are relatively common, not that much more than the cost of two single stamps. All of the orange brown stamps (Scott #10) were printed from the brand new, early states of the following plates: Plate 1E, Plate 1I, Plate 0, Plate 2E, and Plate 5E. These plates were ONLY used from July through September of 1851. There are also many different shades of the orange brown stamps printed during this period. All of the many "red" and "claret" ranges of shades (Scott #11) were printed from the following plates: Plate 1L, Plate 2L, and Plate 3 were used between October 1851 and March 1857. Plate 4, Plate 5L, Plate 6, Plate 7, and Plate 8 were used between September 1855 and September 1857. In the image above, the stamp on the left is a bright orange brown shade (#10) from September 1851. 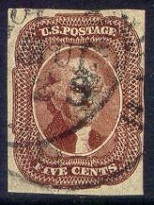 The stamp in the middle is a brownish carmine shade (#11) from late 1851. 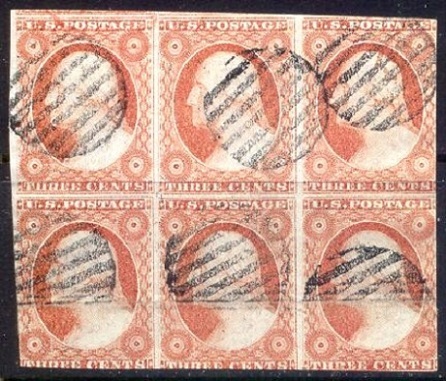 The stamp at the right is a claret shade (#11) from early 1856. 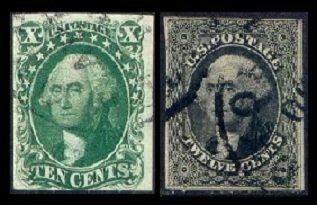 Be extremely careful, when buying any US classic stamps of the three cent issue of 1851 that are offered as Scott #10 without them having reliable plate attribution! As a general rule, probably 98% of the #10 stamp lots being offered on eBay at any one time are actually miss-attributed Scott #11 stamps. Both of the stamps shown above are from the identical plate positions on Plate 2. The stamp on the left is position 64L2E, which is a Scott #10 in the orange brown shade from August or September 1851. The stamp on the right is position 64L2L, which is a Scott #11 in an orange red shade from probably 1854 or 1855. Look at the difference. The stamp from the early state of Plate 2 has clean re-cutting, the frame lines are strong, the background devices are clear, and most importantly, the fine lines in the face and hair are all distinct and razor sharp! The stamp from the later printing of Plate 2 exhibits obvious plate wear! The frame lines and background devices are faint and smudgy looking, the re-cutting from the early state of the plate has almost worn away, and there is hardly a trace of any fine detail in the face or hair! Yet I have seen people on eBay selling stamps just like the one on the right as Scott #10. And sadly, I have seen unsuspecting collectors actually bidding on them!! The scope of collecting possibilities for the US classic stamps three cent issue of 1851 is endless. There are whole websites, many of them excellent, devoted to this one issue. Getting the materials necessary to study and plate the three cent stamp can be expensive, but once one has all the tools, one can become engrossed in the study of this issue for years, without breaking-the-bank. I did, back during the 1980's and 1990's, and I managed to reconstruct most of the "red" plates, using a little mentoring from experts, the Carroll Chase book and plate photographs, and "plating-lots" of US #11 purchased at stamp bourses and off eBay. It was an expensive project, but the results made it most worthwhile! Much more is to be said about this issue, but this page is intended to be an "overview" of the 1851-1856 general issues. In the future though, I will add additional pages to the link section on the main USA - Classics page that will address the plating, cancellations, shades, and varieties of this wonderful three cent postage stamp issue of 1851-1856. The five cent denomination shown above (Sc. #12) was not issued until March 1856. This design featured a portrait of Thomas Jefferson. These US classic stamps were originally issued to pay the registration fee, but that fee was usually paid in cash at the post office counter. Pairs were sometimes used to pay the post-1855 letter rate for letters to San Francisco and other destinations greater than 3,000 miles. This imperforate stamp was only available for use for about one year, before it was replaced by the new series of perforated postage stamps in 1857. As a result, it is the scarcest denomination of the series of 1851, and nice used examples are expensive, as well as difficult to locate. The 10 cent denomination was issued in 1855 to pay the new postage rate on letters to California or on those traveling distances of greater than 3,000 miles. The attractive looking design features a Gilbert Stuart painting of George Washington. There are four major types of these US Classic stamps, which the Scott Catalog lists as Type I (#13), Type II (#14), Type III (#15), and Type IV (#16). The three stamps shown in the image above, from left to right, are Type I, Type II, and Type III. All of these stamps were all produced from one 200 subject plate. 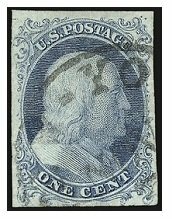 For drawings and descriptions of all the individual types of the 10 cent issue of 1851, please refer to the Scott US Specialized Catalog or to the Scott Standard Postage Stamp Catalog Volume I. These US classic stamps are actually more common than one might think from looking at the catalog valuations. Just five years after the discovery of gold in California and the ensuing "Gold Rush", large volumes of mail were traveling from the Eastern US to California destinations at that time. Almost all the letters were franked with one or more of these 10 cent stamps. If one collects anything to do with early California postal history, they're going to wind up with a LOT of these stamps (or the later perforated ones) in their collection. The 12 cent denomination shown above (Sc. #17) was issued on July 1, 1851 as a quadruple letter rate stamp. These US classic stamps were generally used for heavy letter mail, to make up large postage amounts, or on foreign mail. This design also depicts a Gilbert Stuart painting of George Washington. As with the five cent and 10 cent denomination US classic stamps of 1851-1856, this stamp was printed from one 200 subject plate. One would think, with the odd denomination, that this stamp would have seen little usage, but that is not true. Used examples are relatively common, though covers with this stamp are scarce. In 1851, the Eastern United States had the railroads, but their development was still in its infancy. There wouldn't be a trans-continental means of rail travel for another 18 years. The basic means of distance traveling was either on foot or by horse. Traveling long distances to remote areas of the country was next to impossible and very dangerous. It was the postal system that brought newspapers and letters to remote parts of the United States, keeping the country "connected", and allowing it to prosper and grow.